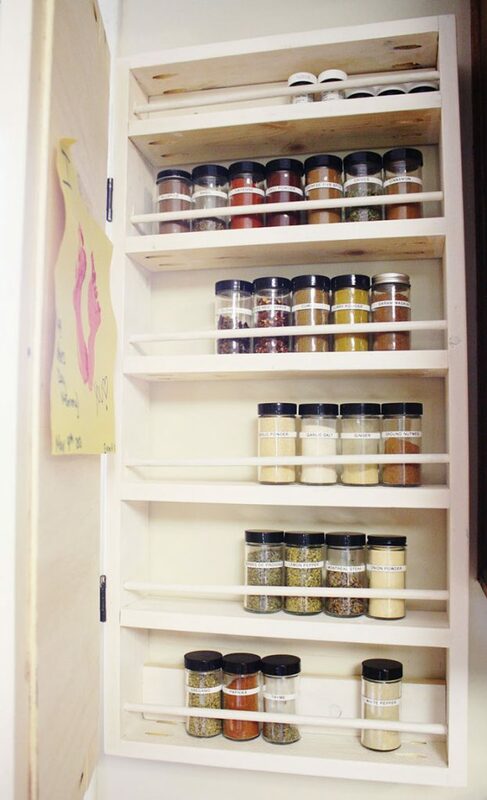 Ready to spice up your storage space? (Yes, this list is going to be filled with my awesome puns). 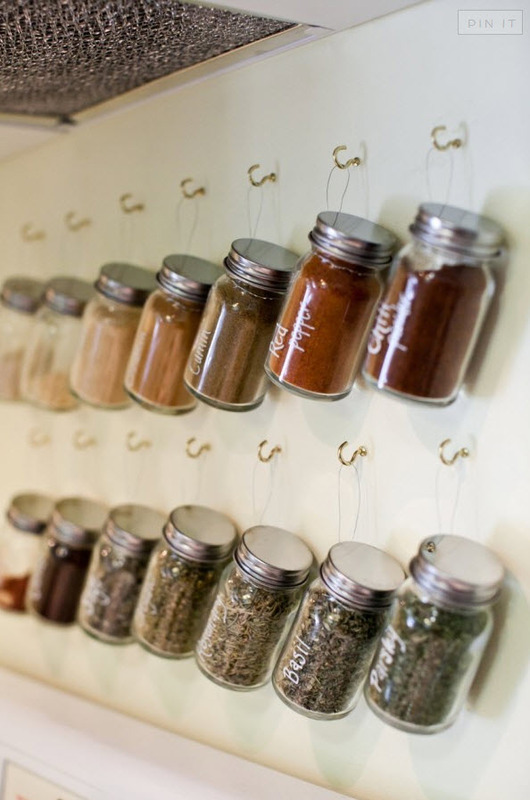 Filling up your collection of spices always starts with the best intentions, you begin by politely placing them all in a cute row in a cupboard. 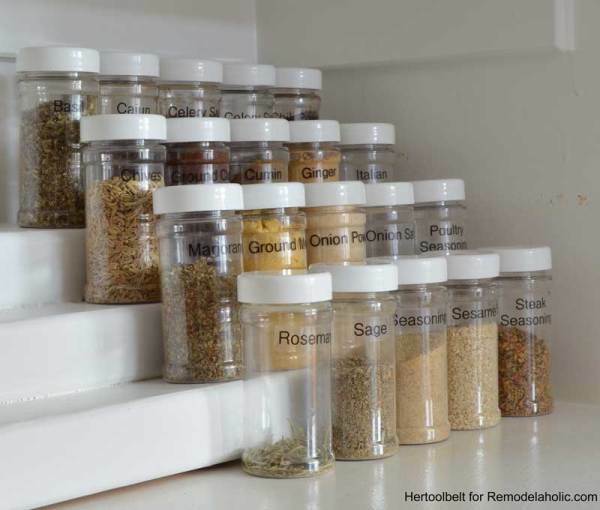 But after a few months, maybe a year, you’ll find yourself with a city skyline of 300 tiny glass bottles claiming half your pantry. Stop right there! (yep, a Spice Girls reference, thank you very much). 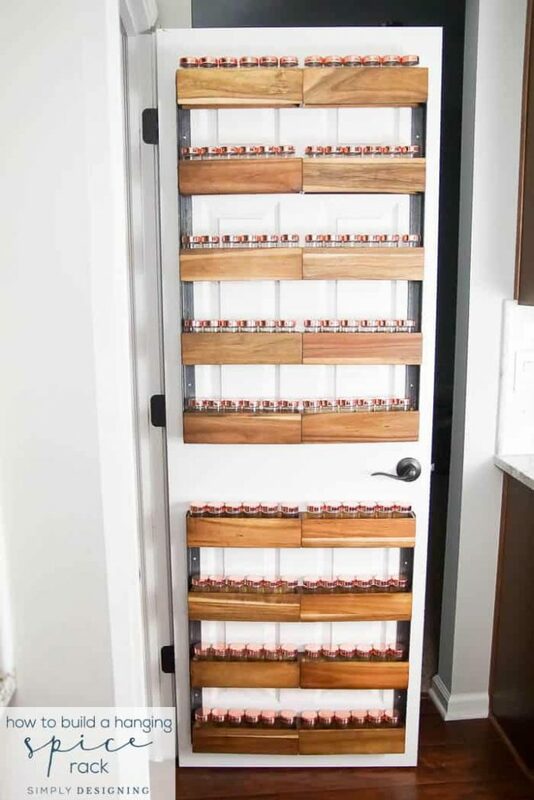 Let’s look at some fun ways to organize all the bottles you’ve hoarded. Ranging from the easy and quick, all the way to the elaborate and glamorous. 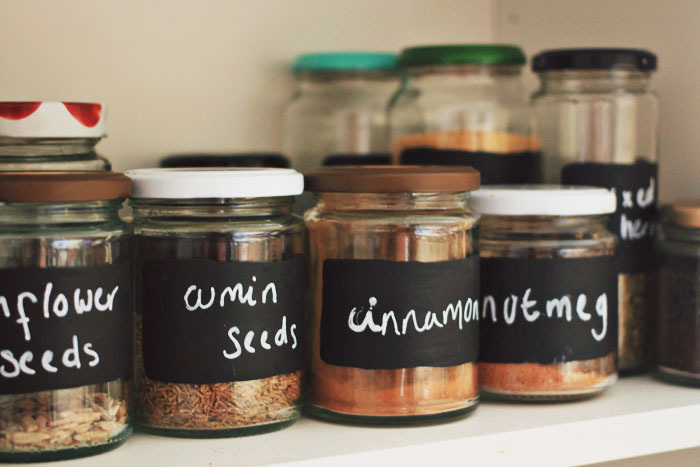 Sometimes the easiest solution is the best one, like some proper labeling and jars. And who doesn’t love these cute chalk board style labels? 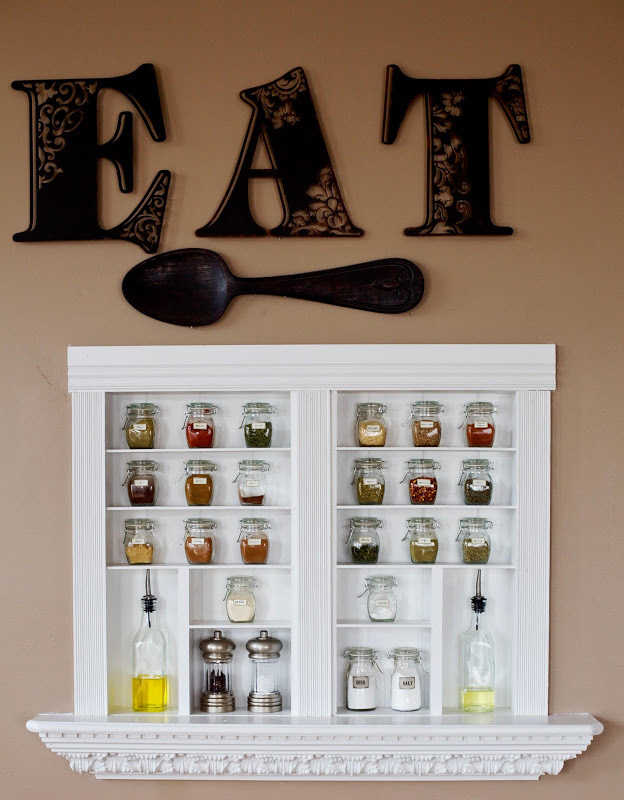 Not to mention, it’s a nice way of recycling used jars. How awesome is this? 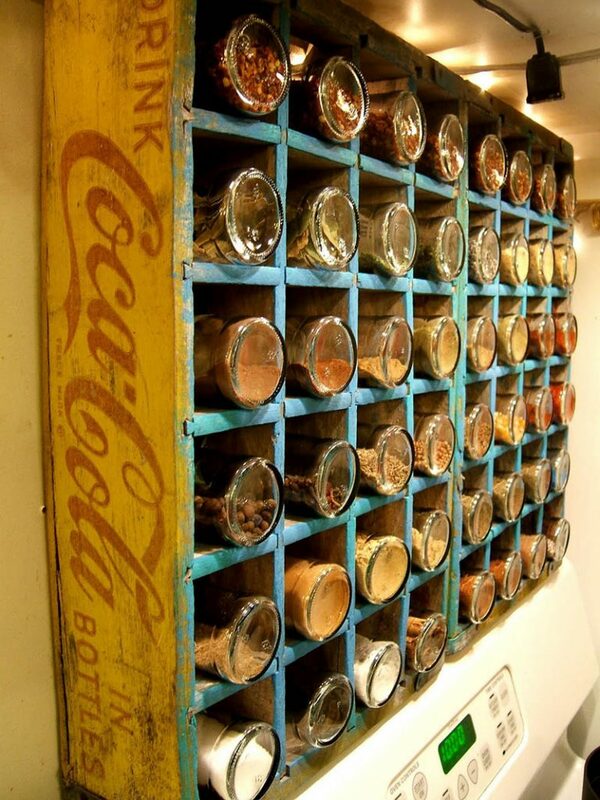 Using an old coca cola factory crate to hold the spices, genius. The hard part is finding a vintage wooden box like this, so you might have to go do some investigating at antique stores, flea markets, garage sales, or even pay a visit to some local factories. Now we get into something significantly more modern, and requires a little woodworking skill (and some tools as well). The end result is stunning. Going back in time again, using a Victorian style serving tray found at a thrift shop. Simply hung on the wall to make this very unique rack. It’s clever and absolutely charming. Maybe hunting for antique items to hold your inventory isn’t your style, maybe you just need practicality. 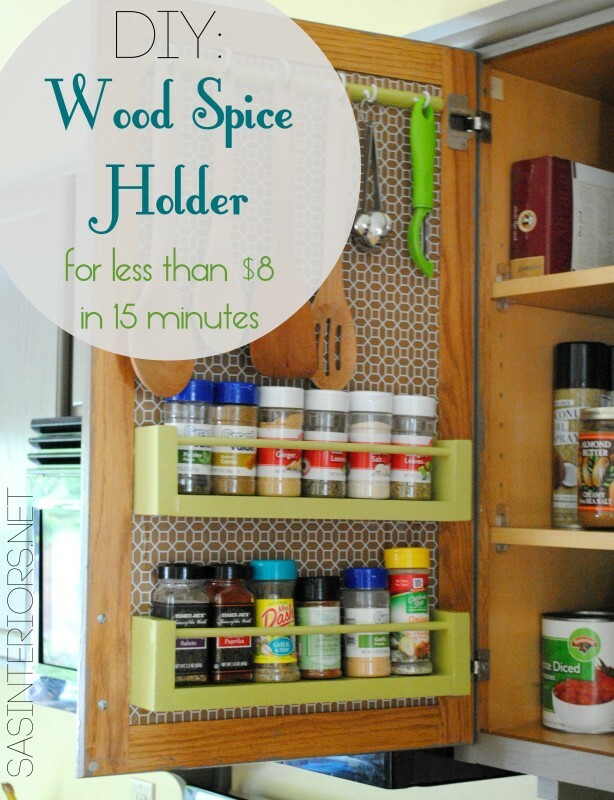 With $8 and 15 minutes you can organize everything that’s been driving you nuts (well, the spices at least). How awesome is this? 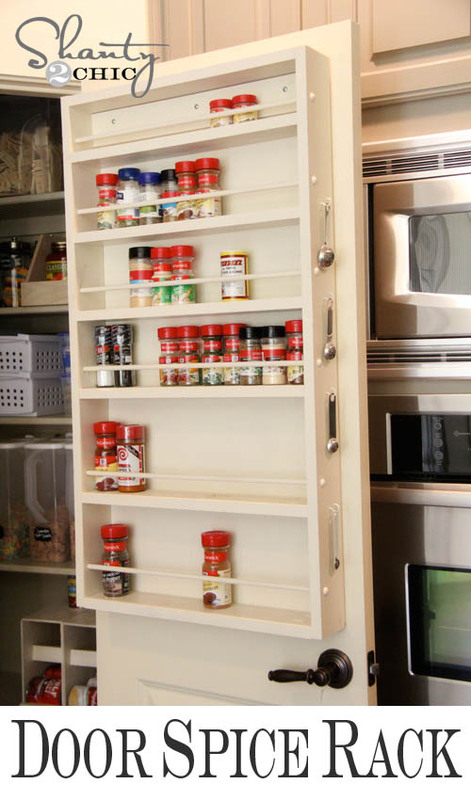 It slides out from underneath your counters, like a super hidden compartment for your stash. 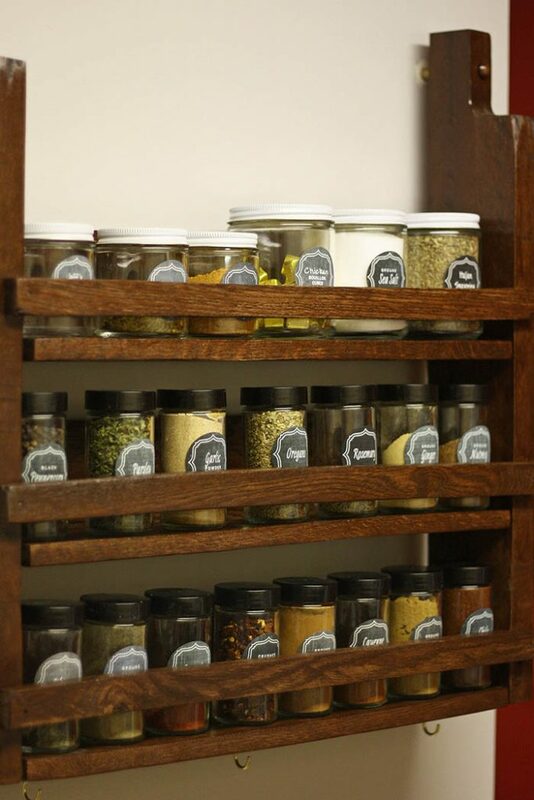 Of course your stash being your cooking spices, because we’re cool like that. 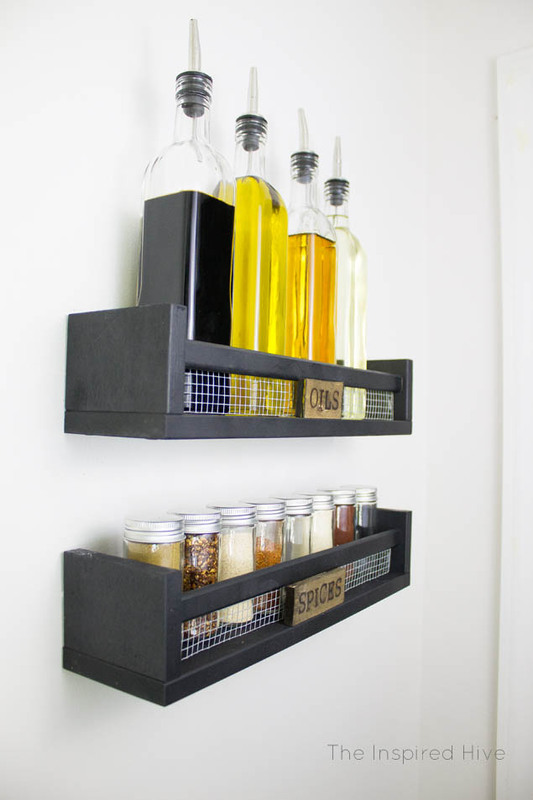 One thing we love around here is pallet projects. Pallets are easy to get a hold of for free, and the reclaimed wood always leaves a rustic/farmhouse look to your projects. This rack is next level. 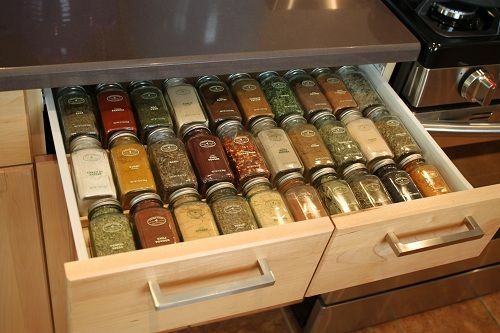 I would assume if you have that many spices in matching jars then you’d automatically be a chef in my mind. 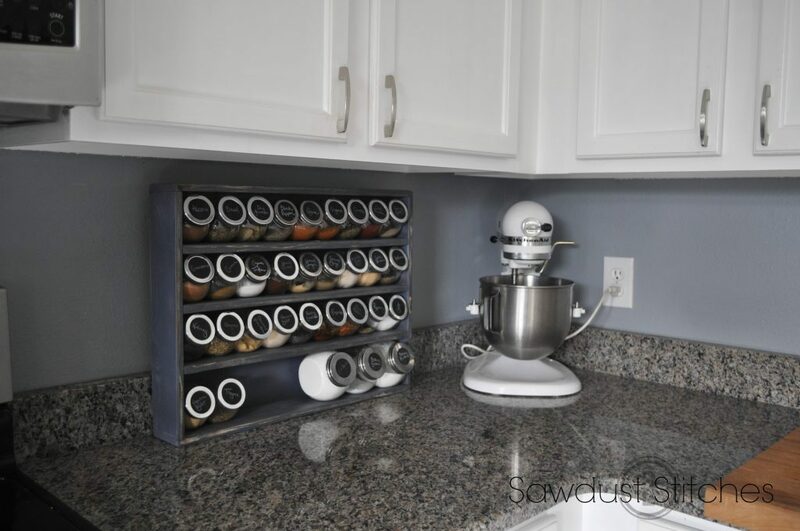 This dual layer drawer is all kinds of awesome, and something I would expect in a Jason Bourne’s kitchen (if Bourne was a chef instead of an assassin). You’ll need a small assortment of power tools to complete this build however. This one combines so many clever ideas into one fantastic project that’s easy to build. Magnetic board, on a chalkboard, and then framed. Perfect, right? 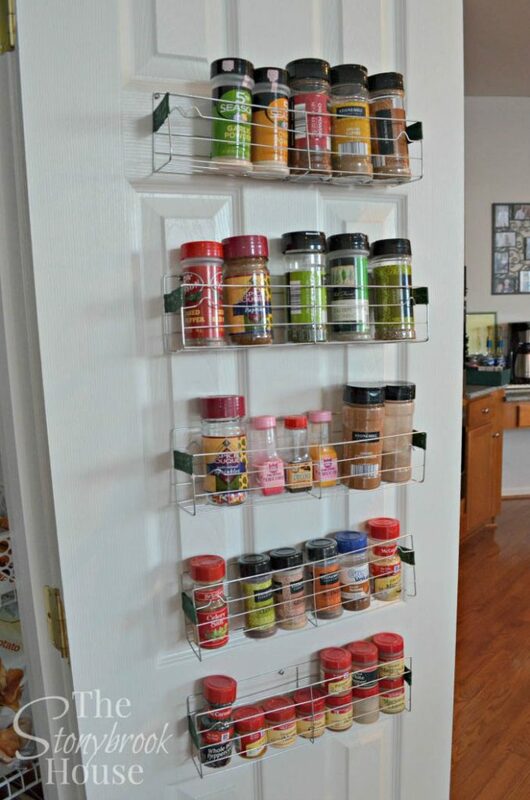 Ahh yes, the behind-the-door rack, a favorite among spice lords. This one looks so well done is honestly looks store bought. Shanty2Chic does a great job of walking us through the build process so you can build your very own. Super practical and easy, that’s what we got here. If you got yourself a screwdriver, pliers, and a few dollars to spare then you’re in business. We love rustic stuff here, and this one is beautiful and practical. The wire mesh and the wood label is a nice attention to detail that adds to it’s charm. 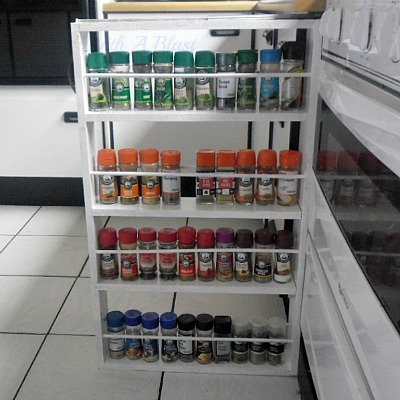 The best part is this spice rack is mostly assembled for you, because you can buy it from Ikea and then just paint it. How cute is this? And very clever. Hang your bottles like Christmas ornaments for easy access. Building a tiny set of stairs using some wood, you can tier your spices for easy access and reading. Because nothing is more annoying than having to dig through 40 layers of bottles to find the one you want at the very back. This might look complex, but it’s actually very simple, using a few wood pieces to build rows within your drawer. 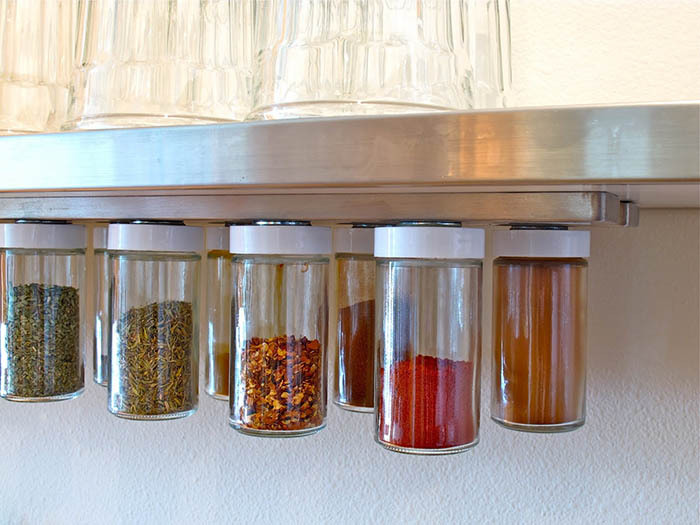 Now your spices can stand in attention, waiting for battle. Sometimes when I’m cooking I wish I could be in Professor Snape’s potion class (that’s a Harry Potter reference for anyone out of the loop). Hey look! 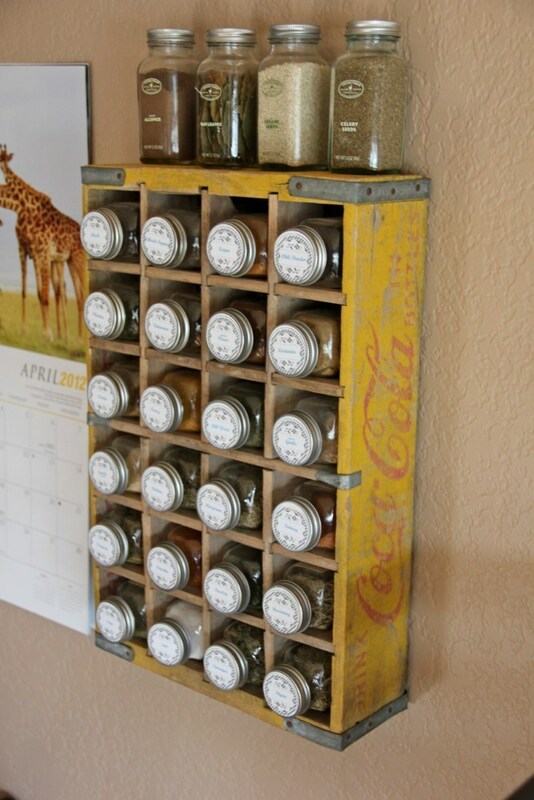 Another coke bottle rack, but this one provides a few more details on how you can find one (spoiler alert: the side of the road), and where to get these perfect little bottles that fit perfectly with the rack. 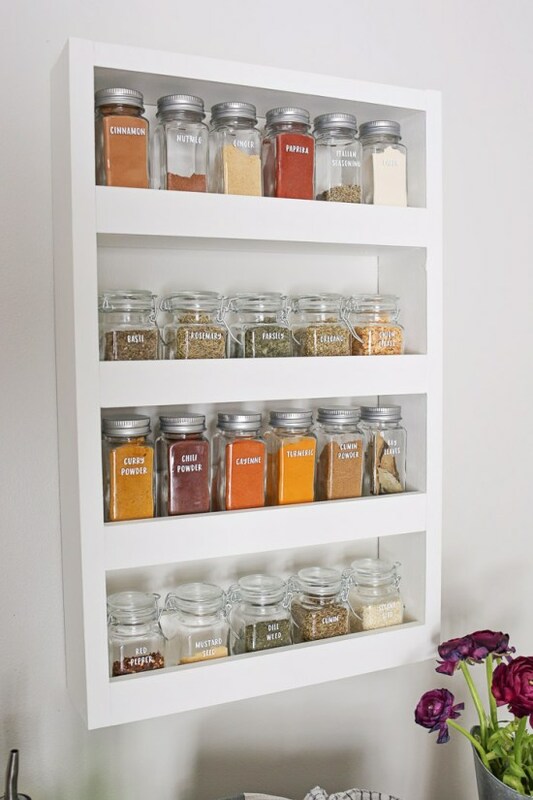 You can find these little magnetic strips at Ikea, then you can either glue something metal to spice jar lids, or find some magnetic jars (either one works great). 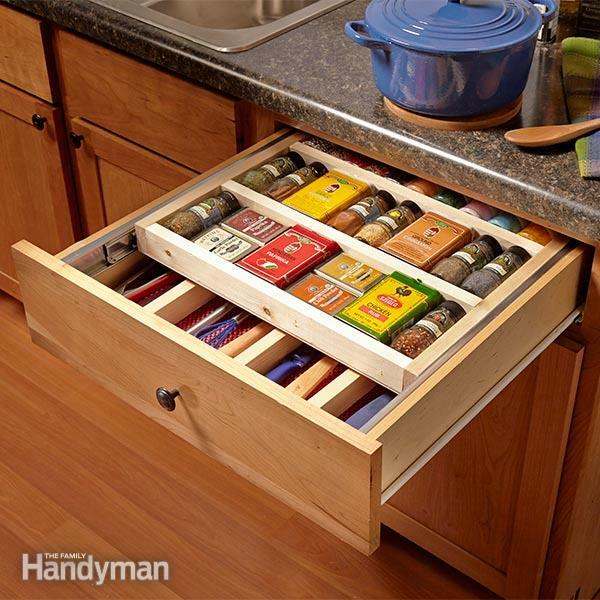 This cabinet requires a little extra measuring, cutting, and painting. 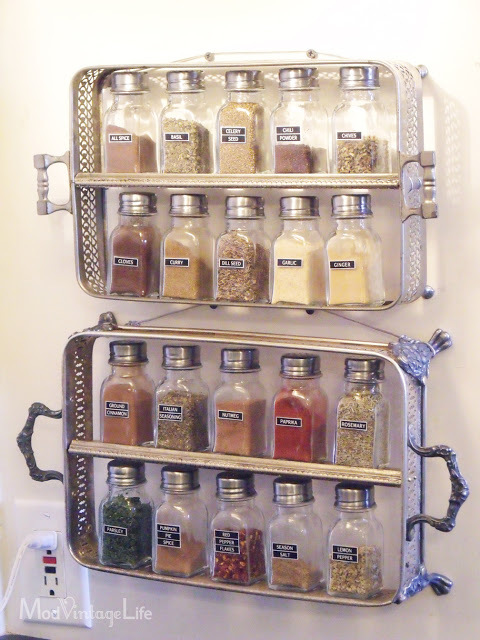 But you’ll end up with this beautiful rustic piece that will match the theme of your kitchen. Okay. This is a masterpiece, and maybe a little over the top. 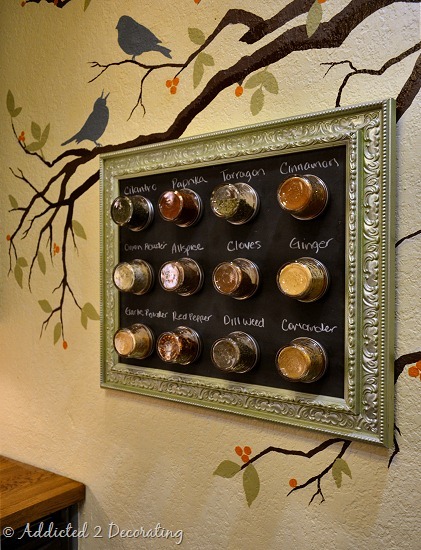 I mean, they put the spice shelf in the wall and then added custom molding, along with a beautiful shelf along the bottom. 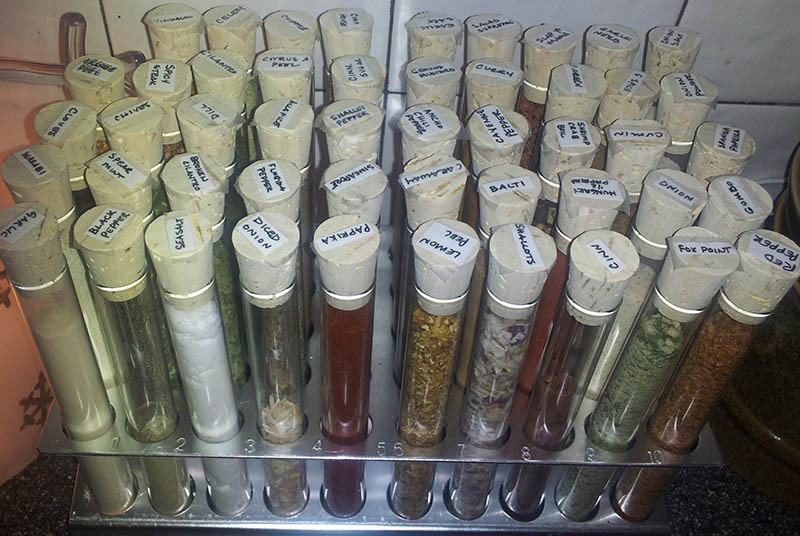 Those spices have a better display than most jewelry. I don’t have the skills to pull this one off, but if you do then I bow down to you. Let’s end on a high note. This shelf is another carpentry project, and comes out looking beautiful. Not to mention the front door is actually a chalk board (which I love).